The Fellowship was fortunate enough to obtain a copy of KING CONAN: HOUR OF THE DRAGON #1 from Dark Horse Comics. Timothy Truman writes and Tomas Giorello draws. The great magician Xaltotun has been resurrected by a group of usurpers and traitors in order to help them take over their respective kingdoms. But the first king they look to dethrone is Conan the Cimmerian, who will not go down easily. On the eve of battle, Conan is struck down by fell magics, and his armies do not fare well in his absence. But he’s not through yet. This is the first issue of an adaptation of Howard’s novel, and so far it’s a beautiful rendition. The art gives a wonderful “dark fantasy” feel, and Truman does a fine job of adapting what is a really good story to start with. This novel is a high fantasy classic, and this treatment is shaping up to be very impressive. If you’ve never read Howard’s Conan stories, this would be a great place to start. If you’re already a fan, pick up this beautiful adaptation. It’s a winner. 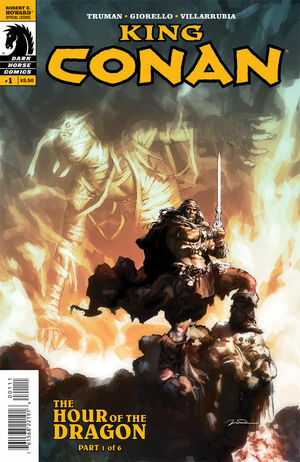 KING CONAN: HOUR OF THE DRAGON #1 is available now at your FLCS or by order at darkhorse.com.